FLEEING FROM BIRTH CERTIFICATE TO “LEGITIMACY” - A shocking change in the content of reporting at NBC, CNN and CBS indicates the pro-Obama media are beginning to stagger under the weight of facts which plainly show that Barack Obama has never provided valid, corroborated documentation proving he is constitutionally eligible to hold the office of president. New York, NY - The pro-Obama, liberal mainstream media is showing symptoms of fatigue in their endless defense of Barack Obama’s fraudulent identity. A sudden reverse in liberal media content indicates they are realizing defense of Obama’s “eligibility” based on rapidly fading support of his fraudulent birth certificate is no longer sustainable. The lies about Obama's identity are becoming too heavy for those undersold as errand-slaves for the bowing liberal consensus. In at least two broadcasts by CBS ad MSNBC, following Mitt Romney’s campaign rally joke about his own birth certificate, hosts from the leftist networks used a new word to defend Barack Obama’s fading credibility. Defense of Obama's "legitimacy", not "eligibility", is now emanating from media propagandists indicating they can no longer defend the lie that the digitally forged image of an alleged 1961 “Certificate of Live Birth” proves he is “eligible” to be president. Now, they are desperately hoping everyone will forget their abetment of the “eligibility by fake computer image” lie and show grace for Obama’s contingent claims to “legitimacy by popularity” instead. Then, Romney’s joke evoked an almost desperate need from CBS’s Scott Pelley to hear Romney say that Obama was a “legitimate” president, while Pelley completely avoided the tired lie that the digital image of Obama's alleged 1961 “Certificate of Live Birth” posted on an official government website in April, 2011, was authenticated proof that Obama was eligible to be president. Romney told Pelley the comment was a joke based on the fact that he and his wife, Ann, were born and raised in Michigan. However, the only reason Romney has for referencing a request of a birth certificate is Obama's failure to provide a valid one over the past five years. "No, no, not a swipe," Romney replied. "I've said throughout the campaign and before, there's no question about where he was born. He was born in the U.S. This was fun about us, and coming home. And humor, you know -- we've got to have a little humor in a campaign." Unconvinced under the crushing weight of his chronic dissonance, Pelley then posited a question which reveals the old lie is no longer effective and that he is beginning to rethink his position on Obama’s alleged birth certificate and constitutional eligibility. “For the record, will you say, once and for all, that you believe Obama is a legitimate president?” pleaded Pelley. Romney answer accompanied a light in his eyes indicating he now understands that a question about Obama’s "legitimacy" is not the same as one about his "eligibility". He also realized from Pelley’s question that the media knows it, too. “If you have the wherewithal to suspect that sharks are preparing to attack because they happen to smell blood in the water, perhaps instead of asking why the sharks are attacking, you should ask, why am I bleeding?” asks TDP editor, Pen Johannson. Eligibility is based on a legal requirement rooted in the rule of law and doctrinal precedent over the past 250 years in America. Legitimacy, on the other hand, is a transient status of subjective entitlement based on the fact that voters supported the candidate, even though the candidate was never legally eligible to be elected. In 1840, John Tyler, serving as Vice President as the first ever candidate eligible for the office of President born after the adoption of the U.S. Constitution, became the first candidate required by the Constitution to be a Natural Born citizen of the United States, which he was. However, Tyler was also the first candidate to perform the duties of President without being elected to the office. He was forced to assume the powers and duties of president upon the untimely death of President William Henry Harrison just after the 1840 election. Many in opposition to Harrison’s administration refused to acknowledge Tyler as a “legitimate” President, even disparaging him as “His Accidency”. Harrison's unprecedented death in office caused considerable confusion regarding Tyler’s succession despite the fact that he was eligibile. The Constitution did not endow Tyler with the title of President in his own right, just the powers of the office. It only stated that the “Powers and Duties” of the deceased President Harrison would “devolve” upon him as Vice President, not that he would hold the office. Read literally, Tyler would remain the Vice President with presidential powers, as Acting President, but he could not be called “President of the United States”. In spite of his constitutional eligibility to be president, Tyler’s opponents refused to acknowledge that he was a “legitimate” president. Therefore, it is completely absurd for the liberal media to actually expect that Obama would be considered “legitimate” without a shred of documented proof of eligibility. Obama’s legal right to hold office has never been verified because he does not possess the historical proof to show that he meets the requirements stipulated by Article II, Section 1, Clause 5 of the Constitution. Shultz and Pelley, like the remaining slew of pathological liars in the liberal media, are being confronted with a terrifying reality that there is no proof that Obama is actually who he claims to be, let alone be eligible to be president. Moreover, they are realizing that only Obama, not original sources, has been the only one they were allowed to receive information from about his identity, which they willingly swallowed and so enthusiastically defended as the truth. Now, they see the fox in the hen house. The shift in perception indicates the delusions of liberal media are now being confronted with the reality that Obama has poisoned and corrupted their personal and professional reputations. They are beginning to think Obama might actually be a fraud. Long ago, CBS and NBC sold out to Obama’s lies and have no way to reconcile with the soul crushing truth so they no longer have the credibility to fight the cause for Obama based on the losing proposition that the birth certificate represents the truth about his identity. It does not. It represents the greatest lie ever told to the American people, and they are beginning to realize it. Yes, a CBS writer, lost in ideological delusions about Obama’s eligibility grandeur, actually used the word, “drove” in attempting to convince themselves of an elusive reality about the intentions of Romney’s comment. Of course, CBS reporters can provide no documented proof that Romney’s comment was directed at Barack Obama. Sounds a little like CBS believes there is a coo-coo conspiracy to undermine Obama. They are beginning to sound more like what they accuse so-called “birthers” of, everyday. CBS and other liberal emanations seem to be slowly admitting, now, that the derogatorily called “birther” movement must have had the power and facts to “drive” the anointed One of a bowing liberal consensus to the brink if destruction by forcing him to actually provide evidence that he is who he says he is. Think about what CBS is claiming. A bunch of crazy, rightwing fringe racists “drove” Obama to present a digitally fabricated image of an alleged 1961 birth certificate which was proven by 10 month-long criminal investigation to be a forgery? They sound like crazy left-wing conspiracy theorists. Acknowledging the power to drive an alleged “legally eligible” president to prove his legitimacy is a lot of respect to assign those formerly considered a bunch of crazy conspiracy theorists. Imbalanced pundits like Shultz and Pelley are beginning to look like fools. Labeling those who question Obama’s eligibility as racists and crazy people is beginning to come back on liberals in a very destructive way. When the truth is against you, your condemnations will return to haunt and destroy you because no aspersion you cast holds credibility once the lies you defended are exposed. At that point, you have become worthy of destruction and ridicule. Let’s talk about Obama’s legitimacy, shall we? After all, sarcastically speaking, it’s not as if suspicions about Obama’s illegitimacy were actually based on facts about his past, like the fact that his alleged father was never a U.S. citizen…which means he is not a natural born citizen of the U.S. and therefore not constitutionally eligible to be president based on 250 years of legal and doctrinal precedence. Facts like, Obama voted in favor of congressional resolution 511 stating that his 2008 opponent, John McCain, was a natural born citizen because, unlike Obama, both of McCain’s parents were U.S. citizens serving in the military and, therefore, eligible to run for president, despite the fact that McCain was not born in the U.S.
Obama lived to Indonesia as a boy, attended school as Indonesian citizen as required by Indonesian law and so stated on his school registration form, and has never provided documentation showing that he retained his American citizenship upon return to Hawaii in 1971. Obama traveled to Pakistan, by his own admission, using a passport which would show his citizenship status in 1980 and, yet, it has never been allowed to be seen by anyone. Legitimacy? Obama refuses to provide his college transcripts which contain information about whether or not he attended school as a foreign student, which would show that if he received foreign scholarships he could not have applied as a U.S. citizen. The Democrat Party of Hawaii chairman, Brian Schatz, refused in August of 2008 to provide an “Official Certification of Nomination” containing legally required language under Hawaiian election laws stating that Obama was “constitutionally eligible” to hold the office of President. Obama’s literary publicist printed in an official promotional brochure for 16 years that he was born in Kenya. Obama’s alleged Selective Service registration card, allegedly signed by Obama a day AFTER it was stamped by a Honolulu postal worker, apparently using the only two-digit year received stamp ever possessed by the U.S. post office, was determined by a six month law enforcement investigation to be a forgery. Requests by investigators for the original record from the Selective Service Administration were denied without explanation. The digital .pdf image of his alleged 1961 Hawaiian “Certificate of Live Birth” has been proven through a criminal investigation by officials with decades of federal, state and local law enforcement experience to be a fraud. Legitimacy? Obama’s horde of puppets have a better chance of winning the eligibility argument using the forged birth certificate. THE LIBERAL YELP HEARD ‘ROUND THE WORLD: Throwing the "eligibility" rock into a pack of liberal media, Mitt Romney has discovered attacking Obama’s fraudulent identity is a very effective discourse rooted in apocalyptic truth which has the potential to restore honor, authority and the rule of law back to American government. Hurting the liberal establishment with the truth about Obama’s fraudulent natal origins and his communist beliefs will allow superiority and exceptionalism to return to America and will likely drive the greatest economic expansion in a generation. However, the most important result of Romney's truth message is one which will restore confidence in Constitutional sovereignty of America while he presides over a national recovery after the most lawless regime in American political history. NEW YORK, NY – After Mitt Romney’s appearance at a campaign rally in Commerce, Michigan, where he made a poignant and long-overdue reference to Obama’s fraudulent eligibility documentation, it took only minutes for the pro-Obama liberal media to respond. What followed was an utterly pathetic and shameful display of hate-filled hysterics wrought with delusional allegations of racism. The desperate attempts to minimize the damage to their “precious” Obama revealed just how vulnerable the fragile psyche of the liberal media has become…and how devastating the epic lies about Obama’s identity have become to their sense of purpose and lust for social justice. Unfortunately, prior to Romney’s joke on Friday, powerful conservatives were not willing to define the boundaries of standard political discourse outside the limits of the media’s portrayal of Obama’s identity. The problem with this decision is that it was based on a lie they were told by degenerates who were biased in favor of Obama. For too long conservative powers have surrendered their most effective message against the radicalism of a social misfit to a fraudulent media authority. Moreover, Obama’s weak-minded political opponents on the right, including Congressional Republicans and many conservatives, including Rush Limbaugh and Sean Hannity, have long treated his highly suspicious biography as though it was unassailable because they simply did not have the intestinal fortitude to weather accusations of being called racists by foul-minded rejects. Allegations of racism in protecting Obama has grown stale, old and ineffective for liberals. In the face of such stark evidence, the public authority is simply not believing that liberal lie anymore. Instead, Romney’s comment-for-effect has revealed these desperate and vile deceivers attempted to set arbitrary boundaries around Obama which no longer define the fringes of mainstream willingness to attack him upon the very metrics by which he was so dishonestly defined through media lechery. Obama’s fragile identity has now become fair game and his supporters know, from the top of their head to the depth of their perishing souls, he cannot politically, or socially, survive the argument in this realm. The truth against Obama's legitimacy as president has been a desperately concealed weapon of mass destruction that liberals are psychotic to keep hidden. So, where should Romney go from here? For many who seek justice for Obama’s violation of Constitutional and civil law, there are no longer any restrictions on Romney’s capacity to wield the eligibility weapon against Obama. Romney’s brilliant strategy of attacking Obama at the heart of his weakness, his very identity, has triggered terror and desperation among the Obama political machine. The Obotic horde knows they have no way to counteract the truth that Obama is an undocumented fraud and a rank street hustler whose façade is beginning to crack under the weight of righteous condemnation. Romney's advisors need to understand the righteous mandate they hold in the truth about Obama's counterfeit identity. They need to learn that Obama is inferior because he is liar, not because of his demography, but because of his foul hatred of vintage American heritage. They need to package a devastating analysis into an easily digestable but potently destructive message conveying the facts about Obama's political illegitmacy. They need to help Romney construct a campaign message which is rooted in the historic truth about America's Constitutional sovereignty and the rights endowed by our Creator for those who recognize and hold such honorability. Vintage America must be reminded by Romney why their fathers died and bled. They need to be told the sacrifice of their fathers was to prevent despots like Obama from attaining power fraudulently and deceptively and that the reason Obama has refused to reveal documents like his birth certificate, college transcripts and other personal records is because they contain information which proves he is the most prolific criminal usurper in history. Romney’s joke in reference to Obama’s birth certificate shook liberals to their core. The media’s reaction confirmed this. More importantly, however, the comment was the manifest destiny of millions of Americans who have been victimized by the single most prolific lie in American political history and who have been sounding the alarm about Obama's fraudulent identity for years. Barack Obama is an illegitimate fraud who has never been held to account for his failure to demonstrate that he is eligible to hold the office of the president. Romney’s comment, in a small but very powerful way, was the culmination of many years of very hard work by patriot citizens. It was a sign that honor and truth are still alive despite Obama's attempt to destroy them with "hope and change". Romney’s recent expose’ of Obama and his criminal abettors reveals that Romney finally sees the potential of seizing upon the unlimited treasure trove of destructive evidence against Obama that the rest of us have been hewing from the “hypogeum” under the White House for five years. When the truth hurts a liberal, they falsely believe that if they can just muster enough fake outrage and incredulity in the face of what is, in fact, an accurate accusation against them, that it will somehow convince everyone they are right. The writings of Satan-lover, Saul Alinski, have been very effective in creating dissonance in the minds of his morally-ill followers by convincing them that when a political opponent has discovered the evil truth about you, you respond, not by speaking truth to the accusation, but by smearing the truth teller with even more lies. Liberals attack accusations of dishonesty with, well, more dishonesty. Romney’s comments are the beginning of the end of the liberals’ love affair with their own pathetic sense of purpose in humanity, which has always been based on a lie, just like Obama’s constitutional eligibility and political legitimacy. Liberals, especially those who blindly support Obama, by their very nature, do not have truth on their side. They reject facts about Obama’s identity long before they ever sold their soul to him. This is one of the defining characteristics of Obama’s supporters. In order to achieve any level of political or economic legitimacy in the minds of the most ignorant citizens, they must lie, cheat or blame someone else for their failures. In order to manipulate the least intelligent of citizens to vote against his opponents, Obama has used a shiny, trinket-laden cloak of pathetic lies while hiding his communist, anti-American ideology behind accusations of racism and conspiracy. The teeth gnashing fact for a reprobate like Obama s that nobody actually votes for a liberal, they just believe the lies liberals tell about their opponents in order to justify voting for anyone but them. 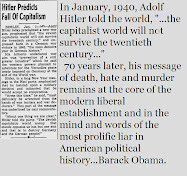 Most liberals in 2008 would have re-elected Adolf Hitler if he ran against the republican candidate because the lies told by the liberal establishment, with the help of a corrupt media complex, were so easily swallowed by the slobbering, blood thirsty mob of Bush-haters. In 2008, more people voted against the Republican party than voted FOR Obama. That’s right. Obama fell into the hole that hatred for Bush left. He’s never been above ground since. Most voters who chose Obama did not actually know him, nor did they like him. They just hated the party of Bush more. Therefore, in true reprobate form, strident Obama supporters are left with only the sordid option of attacking the bearer of truth. OBOTS GNASHING THEIR TEETH – Resounding approval from a Michigan campaign rally crowd following comments by Mitt Romney about his birth certificate reveals that the truth is on his side when it comes to challenging the prolific lies about Obama’s identity and eligibility to be president. Most importantly, the applause demonstrated to Romney that he has at his disposal the most destructive arsenal of political weaponry ever held against a political opponent in American history...and that he has permission to use those weapons without apologies for the sake of America’s future. NEW YORK, NY - Mitt Romney just “went nuclear” in the 2012 President campaign. Speaking at a Detroit-suburb rally, Romney told a crowd of 10,000 that he and his wife were happy to be back in the state of their childhood home when he fired a “test missile” at Barack Obama’s failure to demonstrate his Natural Born eligibility to be president. “No one has ever asked to see my birth certificate…they know this is the place that we were born and raised,” Romney said. The remark received a resounding applause because the crowd understood it was in reference to evidence discovered over the past five years that Obama is ineligible to be president because he has failed to demonstrate his natural born citizenship. Regardless of Obama’s birth place, however, which has never been proven with authentic original documentation, his alleged father, Barack Obama Sr., was never a U.S. citizen. Madden's comments were made without citing a single source of evidence to support the claim that Romney believes Obama is native born. His comments are also irrelevant to the question of Obama's eligibility because the citizenship of Obama's documented father disqualifies him as a candidate, regardless of his birthplace. A natural born U.S. citizen is one born in the U.S. to two citizen parents. In order to protect the sovereignty of the U.S. Constitution from foreign usurpation, America's founders mandated that the office of the president, along with the Vice President, must be held by natural born citizens only. No other office requires the prerequisite because no other office has authority over the military and its weaponry. 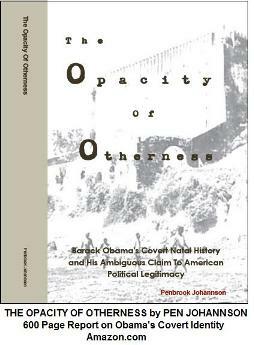 Questions about Obama's place of birth merely address one of three unresolved issues plaguing the authenticity of Obama's identity. Questions have also been raised about whether Obama is lying about the identity of his real father in order to hide his un-American beliefs and his neo-communist agenda. Evidence about Obama’s past, including his childhood and college years, shows that he holds radical communist views and hatred toward, not only vintage American heritage, but white people in general. Obama has long been suspected of harboring a deep seated anger and being motivated by a long held desire for vengeance against what he sees as the injustices of colonialism and economic supremacy by nonmelanic cultures. After the video of Romney’s remarks were posted on YouTube, liberal operatives began firing emails to one another organizing a group effort to descend on the site and post “dislike” ratings and criticism toward Romney. Site statistics shows that videos of Romney's remarks are receiving a disproportionate number of responses compared with other posts. Unlike Barack Obama, Mitt Romney is a natural born citizen of the United States because he was born in the U.S. to two citizen parents. Therefore, Romney is eligible to be a presidential candidate under Article II, Section 1, Clause 5 of the U.S. Constitution. Mitt Romney’s father was born in Mexico but became a naturalized citizen of the U.S. prior to Romney’s birth in Michigan while Romney’s mother has always been a U.S. citizen. Romney has never attempted to hide documentation alluding to his constitutional eligibility like Obama has. Hawaii officials have repeatedly refused to verify the existence of, or authenticate content in, Obama’s original birth certificate which they claim is on file in that state’s Health Department. Explicit requests for the original paper documentation of Obama’s alleged birth in Hawaii have been denied by officials which raises doubts that an original document even exists. In response to pervasive questions about Obama’s birth in April 2011, document forgers working on behalf of Obama posted to an official government website what has since been proven by a law enforcement investigation to be a digitally fabricated computer image of an alleged 1961 birth certificate. The criminals have yet to be indentified. An image of Obama’s alleged 1980 selective service registration card has also been shown to be a forgery. Maricopa County law enforcement officials showed that the card is only one of millions ever processed by the postal service using a two-digit year receipt stamp, while all others submitted have always been stamped with a four-digit year stamp. The card also shows that Obama allegedly signed it a day AFTER it was stamped which would make the signature invalid because a postal worker must witness the indivual signing the card before stamping it. Investigators suspect the document was forged for Obama because he never registered for selective service. Failure to do so would disqualify him from being president. Judges in the U.S. are also hiding from the issue of Obama’s eligibility, refusing to review any of nearly 130 lawsuits on the merits of the actual evidence, fearing the discovery of the evidence would show that Obama is actually a fraud and liar. Essentially judges have cowered to political fears, dismissing the cases based on a false argument that plaintiffs don’t have standing. No case yet has been allowed to move forward on discovery of evidence, let alone been examined under an actual legal argument citing precedent. Of course, a frightened Obama campaign desperately tried to deflect reaction to the remark, saying Romney was embracing "the most strident voices in his party instead of standing up to them." Obama's campaign apparently fails to realize that Romney does not have the power to stand against the truth. INTRANATIONAL SECURITY THREAT - A recently released video produced by a group of former and current intelligence and special forces military personnel explicitly confronts Barack Obama’s professional abilities as a president while demanding that he “shut the **** up” when it comes to military operational security and intelligence information. NEW YORK, NY – Barack Obama did say transparency would be the “touchstone” of his administration, after all. Little did anyone think that Obama's "transparency" would mean his administration's repeated disclosure of sensitive military intelligence to the enemies of the United States. Moreover, it is unfortunate that only a few true patriots in our military, beginning with Dr. Col. Terry Lakin, were courageous enough to risk their professional and personal welfare in order to sound the alarm for the American people that Obama isn't legally qualified to even have an administration, let alone have the opportunity to undermine America’s national security with it. A recently released video produced by OPSEC (Operational Security) Foundation, a recently formed group of current and former military and intelligence operations personnel, demands that Obama and his administration keep quiet when it comes to divulging operational security and intelligence information merely for his own political benefit. In the 22 minute video, Dishonorable Disclosures: How Leaks and Politics Threaten National Security, highly experienced and decorated intelligence and military personnel explain the risks of disclosing information about military operations. They also show evidence that the Obama administration has leaked confidential information about drone missions, agents’ identities, special forces tactics and network security operations. Beginning in 2009, when evidence began to surface that Obama was not eligible to be president, his administration began to come under scrutiny from military commanders and clandestine services personnel for what they called egregious breaches in national security following a handful of high profile intelligence leaks originating from the White House, including information made public about the alleged raid on Osama Bin Laden’s Pakistani compound in May of 2011. In an ironic twist, Obama’s birth certificate and college transcripts are more secure than information about CIA drone missions and special forces tactics. Unfortunately for millions of innocent people, Obama is better at hiding the identity of his real father than the identity of Navy Seals in the Middle East. “President Barack Obama is perceived to a significant degree as responsible for the killing of Osama Bin Laden, and has taken significant steps to use that action to prop up his Presidency politically. A notable amount of political hyperbole has already been provided, witness his leaping to the media platform at 11:45 pm on a Sunday night, and the subsequent comments by VP Biden and others to the effect that it was a “bold and courageous” decision, and that “only one other advisor” favored the action. While neither is true, this action is perhaps the single most powerful symbol Obama will use during the campaign to provide some credibility to his national defense and foreign affairs stature during the forthcoming fall campaign, thereby avoiding what has been referred to as his various “Tours of Apology” overseas. One may assume, as a practical matter, the BHO political media firm has already laid out the spot featuring him gassing up the stealth helicopters. The decision to execute the raid on the compound in Pakistan was unavoidable, and neither bold or courageous. In fact, there was no practical way out. The political cost of failure was far less than the cost not trying in the face of evidence of Bin Laden's presence. To be confronted with the information that there was between a 45% and 60% chance OBL was in the compound and to have not executed the operation to kill OBL, who was responsible for the deaths of approximately 3,000 American citizens in New York City alone and untold others on the battlefields of Iraq and Afghanistan, would have ultimately been discovered, and would have resulted in Obama's removal from office by either electoral defeat or impeachment and removal. There was simply no choice. Being well aware that President Clinton's administration had passed by more than one opportunity to remove OBL before 9/11, and also aware that those instances had become public knowledge, it could have been construed as a bold, courageous (albeit stupid) decision to NOT execute the raid. What has occurred, alongside this and other related actions by special operations forces and the intelligence community, is the public unveiling of classified military and intelligence capabilities for political purposes, thereby posing a serious future threat to the lives of the intelligence and special operations personnel involved in such actions, as well as the exposure of intelligence gathering methods and future special operations missions. In addition, in perhaps the most egregious display of ambition over country by a sitting President in modern times, the President of the United States mounted a media platform on a Sunday night at 2345 hours to announce to the voters that OBL had been killed. This naked grandstanding came despite the fact that DEVGRU (SEAL Team Six) and other operatives had recovered huge amounts of intelligence material, quite probably with information that could have been converted to actionable intelligence, to include dozens of flash drives, computer hard drives and documents that without doubt contained massive amounts of information on the names, locations and operations of Al Qaeda worldwide. This may have been our sole opportunity to utterly and completely destroy Al Qaeda. But before any of this treasure trove of intelligence could be analyzed, without any thought as to consequences, and before any other terrorists could be seized, BHO ran to the stage and announced it to the entire world. In a few brief moments of selfish grandstanding and political opportunism, our Commander In Chief lost the single opportunity to exploit intelligence that, had secrecy been preserved, might well have crushed Al Qaeda once and for all. Within a few minutes of that announcement, every AQ terrorist moved into another rabbit hole where they could not be found, so they could continue their murdering of American soldiers and innocent civilians across the globe. How many have died since that date? Somewhere in the midwest, a redeemed Terry Lakin is trying very hard not say, "I told you so." One of the very dangerous side effects of Obama’s lack of Constitutional eligibility to hold the office of President is that his confused identity makes him dangerously irresponsible when it comes to matters of operational security and military intelligence, according to a group of former and current CIA and Special Forces military personnel. Strangely, however, as national intelligence information becomes less secure under Obama, he is spending untold resources to prevent any leaks about his biographical information and birth records. Essentially, Obama has lost all authoritative credibility and, thus, has become desperate to remain in power. When a politician enters this depth of corruption he or she becomes dangerous politically. They are no longer conscious of the harm they are doing to others because their desperation has blinded them. Moreover, if that politician harbors partiality toward foreign nations over their regard for the people of the United States, inclinations to reveal confidential information about military operations may become intentional. In order to combat the potential threat of a foreign usurper assuming the office of President, the founders of this nation explicitly commanded that anyone seeking the office be exceptionally qualified under three Constitutional requirements. He or she must be 35 year of age, be a resident of the U.S. for 14 years and be a Natural Born citizen. In order to be a Natural Born citizen, an individual must be born on U.S. soil to two citizen parents without renouncement or lapse of citizenship status from birth to election. This set of standards applies only for those seeking the executive office. As we see now, for good reason. DOUBLING DOWN ON HYPOCRISY - Obama's sanctimonious horde of liberal reprobates accuse Romney of not paying taxes, yet they desperately fail to acknowledge the far more righteous and God-honoring millions Mitt has given in charitable contributions to less fortunate strangers. Meanwhile, aside from failing to dislose biographical records like his college transcripts and other information relevant to his legitimacy as president, the rich and powerful Obama won't even offer measely crumbs out of his own millions to help a sick, poverty stricken nephew in his 'home country' of Kenya. NEW YORK, NY - A few days ago I received a call from a man I recently met named George. He was a bit flustered, and soon informed me that his young son was sick with a chest condition. He pleaded with me to send him $1,000 to cover the medical bills. Since George was at the hospital I asked him to let me speak to a nurse, and she confirmed that George’s son was indeed ill. So I agreed to send George the money through Western Union. He was profusely grateful. Obama’s refusal to help George is especially surprising because George doesn’t just live in American-style poverty but rather in Third World poverty. He lives in a shanty in the Huruma slum in Nairobi. He gets by on a few dollars a month. Obama also has an aunt named Hawa Auma, his father’s sister, who ekes out a living selling coal on the streets of a small village in Kenya. She says she would like to have her teeth fixed, but she cannot afford it. Obama hasn’t offered to help her either. What’s going on here? Why is President Obama so hesitant to help family members in need? A couple of years ago, George teamed up with a British journalist Damien Lewis and the two of them published George’s story in a book called "Homeland." Yet according to Lewis, shortly before the book’s publication in America, the publisher Simon & Schuster decided to shred the entire print run, more than 20,000 copies. Lewis tried unsuccessfully to get an explanation from Simon & Schuster but to no avail. He now suspects that the White House convinced Simon & Schuster that George’s story might prove embarrassing to the president. In 2010, George also applied for a visa to come to the United States and was refused. While George confesses that in his younger years he was a delinquent, he has never been convicted of any crime. Moreover, he has a very good reason to visit the United States: his mother Jael Otieno lives in Atlanta. So why would the U. S. embassy in Nairobi refuse a tourist visa to the brother of the president who just wants to spend time with his mother? In the past few days, an article has been circulating on the web that depicts George as a social undesirable. First published in the London Daily Mail, the article portrays George as a habitual drunk and philanderer. I spent a day with George this past February while interviewing him for my documentary film 2016: Obama’s America. I can attest that George is not an innocent. If he had been, he would not have survived life in the Huruma slum. Yes, George is street smart and cunning and I did smell alcohol on his breath. But even if Lewis is wrong, and George exhibits some harmful cultural pathologies, the liberal argument—one that Obama himself makes in his book "The Audacity of Hope" — is that the cultural pathologies of the poor are themselves the product of social disadvantage. Barack Obama Jr. first met George in 1987, when George was five years old. He met George again in 2006 when he visited Kenya as a U.S. Senator from Illinois; George was then in his early twenties. Had Obama helped George along the way, perhaps this young man would not have ended up dirt-poor and living such a degraded life. So what’s the real story here? Where’s George Obama’s “fair share”? George’s tragic situation exposes President Obama as a hypocrite. Here is a man who demands that others pay higher taxes to help the poor—even poor people who are not related to them—while Obama himself refuses to help a close relative like George. Yet I believe there is a deeper explanation that goes beyond hypocrisy for why Obama wants nothing to do with George. After all, it would cost Obama so little to raise George out of poverty, and yet he won’t do it. This isn’t mere negligence; it suggests an active animus. The reason for that animus emerges in George’s book and also in my interview with George in the film 2016. In that interview, George rejects the anti-colonial philosophy that was espoused by Barack Obama Sr. This is the “dream from my father” that President Obama celebrates in his own autobiography. Incredible though it seems, George Obama is, within the context of his own society, a conservative. He doesn’t worship at the shrine of Barack Obama Sr. and he espouses an ideology diametrically opposed to that of his father and his famous brother. George has experienced first-hand the empty rhetoric of the two Baracks, and he rejects it based on his actual experience of Third World poverty. No wonder President Obama despises George, doesn’t want him around, doesn’t care to hear George’s views circulated in America, and won’t lift a finger to help him even when George’s son is in the hospital. So that’s why George Obama felt he had to call me. He had no one else to call. He reached out to me in his time of need because he felt he couldn’t call on his real life sibling living at 1600 Pennsylvania Avenue. OFF ON THE RIGHT FOOT: After four years under an illegally ensconced Obama administration, Mitt Romney courageously heeds widespread warnings against choosing an ineligible vice-presidential candidate and wisely picks Paul Ryan as his running mate. NEW YORK, NY – After four painful years, America will finally get a second chance to vote for a constitutionally eligible administration. Mitt Romney’s announcement that Paul Ryan will be his 2012 running mate not only establishes unassailable legitimacy to his candidacy, it violently casts his lawless opponent into outer otherness and essentially brands Obama as the illegitimately elected political enemy of America that he is, while stripping him of the protection provided by a psychotic liberal media. Foremost, with Romney as President, America can finally have a legitimate discussion about policy under the guise of its legitimacy, without first having to eradicate some illegally-elected, criminal usurper who autonomously decreed it. That’s how far America has fallen under Obama’s criminal regime. Mitt Romney is not the best candidate for president, but should be awarded the presidency simply for standing up to lies about Constitutional eligibility and for casting rotten, despicable politics aside. Despite the transient liberal storm of delusional lust for social justice and racial relevance in politics, Romney still obeyed the law and picked the left's poster-boy target for their deranged contempt and hatred…a handsome, rich, Anglo-American, heterosexual, Christian male from Wisconsin. Sorry Obots. Romney wasn’t able to pick someone from America’s “protected class”. There simply are no black, homosexual, “undocumented”, atheist Republicans serving in American government. However, in choosing Ryan, Romney has also challenged Americans with character and set a crucible of righteousness before us all, and he didn’t sign an executive order to do it. Now, it’s up to us. He made the right choice. Will we the people? Unlike the illegitimate policies and foul laws signed by Obama, no matter how popular they may be with a deranged liberal consensus, Romney’s presidency cannot be undermined by accusations of ineligibility. Romney can’t be called a cheater like Obama. When seeking the highest executive office in U.S. government, both candidates for president and vice president must be natural born citizens to be eligible to hold that office, as mandated by Article II of the U.S. Constitution. Regardless of their political popularity, or skin color, if either candidate is not a natural-born citizen defined by being born on U.S. soil to two citizen parents, the ticket is illegal and, if later elected, illegitimate. Along with evidence that Obama is a foreign born alien and that he may have become a naturalized Indonesian citizen as a boy, Obama’s alleged father, Barack Obama Sr., was never a U.S. citizen. Any of these three conditions disqualifies Obama from being president, retroactively, making every law passed under his false administration illegal and void. By picking Paul Ryan, Romney correctly agreed with the sardonic warnings from the most powerful class of citizenry on the planet about “siding with Obama’s lies” on the eligibility issue. It is estimated that if Romney had picked an ineligible candidate like Marco Rubio or Bobby Jindal, he would have lost approximately 14 million “vintage American” votes from patriot citizens who have, without hypocrisy, condemned Obama’s lack of constitutional eligibility. Both of these men, like Obama, are not legally qualified to serve in the executive office because they are not natural born citizens. Romney’s pick of Ryan is courageous because Rubio would have been a far more politically popular choice with a vast number of former Obama-supporting Hispanic voters and Jindal is simply one of the most talented, hardworking administrators in American government…and Romney did the right thing by making the “constitutional” choice. Unlike Obama, however, Rubio and Jindal are worthy of their success and America’s highest praise and political support insofar as their record of service to America is concerned. It would have been wrong of Romney to put them in a position which forced them to violate the law for political expediency. Truth and justice will eventually devour Obama and destroy his legacy for his crimes against America. It would have been unfair of Romney to put Rubio or Jindal is such peril. Therefore, in the absence of an Article II amendment to the U.S. Constitution enhancing the definition of presidential eligibility while protecting American sovereignty as our founders intended, Romney was forced to do the right thing by picking a man like Ryan, and a resounding kudos to him. More importantly, we should all give a standing ovation to Rubio for supporting and embracing Romney’s adherence to the Constitution. Of course, many agree that Rubio is probably the better man for the job, politically and socially speaking…but the constitution is the law. If we don’t like it, we can change it through a fair legal process. If we ignore it, or intentionally violate it, we get…well…an imposter…a liar…a usurper…a destroyer…a Barack Obama. Romney’s choice of Ryan as a VP candidate is the first step in repairing the massive damage to our government which was so despicably and repulsively violated in 2008 by the most prolific fraud in American history. On the other hand, if the lying consensus is able to illegally re-elect Barack Obama in November, again, pending investigations of certain voter fraud, it will get what it deserves…what it has always had…emptiness, poverty and despair, while being forced to watch God save the rest of us.